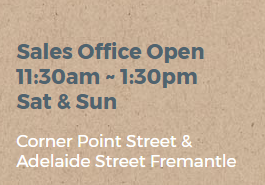 New Marketing launch of Ancora Apartment in Fremantle starting 28th October, every Saturday and Sunday. We are launching our new project Ancora, located at Fremantle! 6-level mixed used development comprising of hotel, retail space and apartments. Ancora is a new boutique development that captures the spirit of Fremantle’s past and present. Situated on historic Point Street, Ancora is central to the best of everything this vibrant city has to offer. On your doorstep, you’ll find an eclectic mix of cafes, boutiques, restaurants and bars to enjoy. At home, each of the one, two bedroom and three bedroom apartments feature stylish, industrial inspired design and luxurious, resort style facilities. More than an address, Ancora is your chance to live your own exciting, port city lifestyle. Perfect for those wanting city fringe living, or for the astute investor looking to make the most out of high rental demands for city fringe rental properties.